For the fourth consecutive year in a row, concerns over fully autonomous weapons have featured prominently at the United Nations General Assembly (UNGA) First Committee on Disarmament and International Security. More than 150 countries are participating in the month-long session at the UN in New York, which is open to registered non-governmental organizations (NGOs). On 12 October, the Campaign to Stop Killer Robots coordinator delivered a statement to the UNGA First Committee while the campaign held a side event briefing on 18 October. 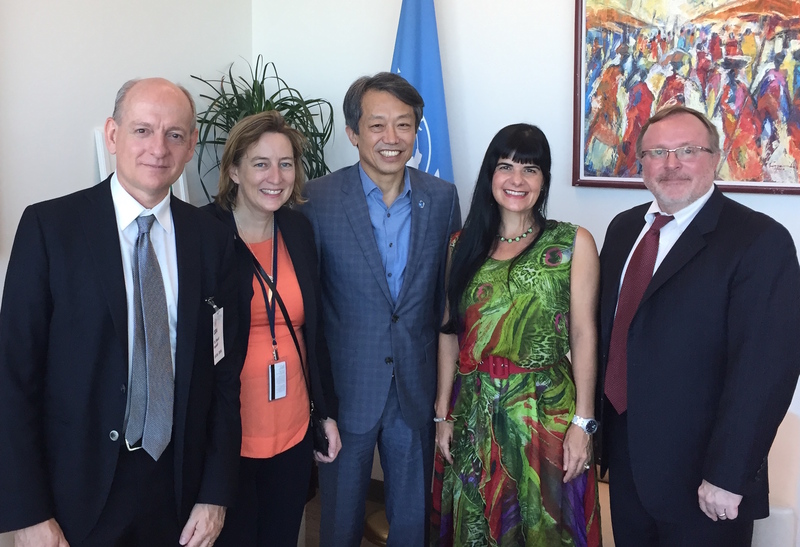 Campaigners met with the UN disarmament chief KIM Won-soo and with France, Germany, Pakistan, the US and other delegations during the week. They also saw Peter Asaro of the New School speak on behalf of the Campaign to Stop Killer Robots at a New York University conference on artificial intelligence and ethics. According to the campaign’s compilation of statements, at least 36 states have expressed support for the CCW process to address lethal autonomous weapons systems during the general and/or conventional weapons debates at the UNGA First Committee on Disarmament and International Security: Austria, Bangladesh, Botswana, Canada, China, Costa Rica, Croatia, Cuba, Czech Republic, Ecuador, Finland, France, Germany, Hungary, India, Ireland, Israel, Italy, Japan, Latvia, Lebanon, Mexico, Netherlands, New Zealand, Pakistan, Poland, Portugal, Russia, South Africa, South Korea, Sri Lanka, Sweden, Switzerland, Turkey, United Kingdom, and United States. This marked the first time that Bangladesh, Hungary, and Latvia have articulated their views on this challenge. Almost every country to address killer robots at UNGA expressed strong support for creating a Group of Governmental Experts at the CCW’s Review Conference in December. Russia, UK, and the US were notable exceptions. The UK and US expressed support for the CCW process to address lethal autonomous weapons systems but did not indicate if that includes establishing a Group of Governmental Experts. Our thanks to Erin Hunt of Mines Action Canada for delivering the Campaign to Stop Killer Robots statement at UNGA First Committee on 12 October. On 18 October 2016, representatives from at least ten states attended a Campaign to Stop Killer Robots side event briefing at the UNGA First Committee: Canada, Cuba, France, Holy See, Ireland, the Netherlands, Pakistan, Russia, South Africa, and the US. The ICRC, UN Disarmament and other agencies, and various NGOs also participated. Professor Matthew Bolton of PACE University facilitated the briefing in his capacity as a member the International Committee for Robot Arms Control (ICRAC), a co-founder of our campaign. Ambassador Tehmina Janjua who is serving as president of the Fifth Review Conference of the Convention on Conventional Weapons (CCW) provided introductory remarks. Guest speaker artificial intelligence expert Professor Stuart Russell of UC Berkeley addressed the briefing as did Steve Goose and Mary Wareham from campaign co-founder Human Rights Watch. Ambassador Janjua welcomed the opportunity to take stock and discuss how she intends to run the Review Conference at the UN in Geneva on 12-16 December 2016. She said the “main task” for the states at the Review Conference will be to endorse and establish a Group of Governmental Experts to carry work forward on lethal autonomous weapons systems, including the time period for when it will meet in 2017 and CCW state that will chair it. On 13-15 December, Main Committee II chaired by Ambassador Tudor Ulianovschi of the Republic of Moldova with vice-chair Ambassador Alice Guitton of France will prepare the draft mandate for future work on lethal autonomous weapons systems.The mandate will be based on recommendations agreed by states at the third CCW meeting on killer robots held in April 2016. Ambassador Janjua recommended that states prepare to actively participate in the Review Conference by considering the recommendations from and chair’s report of the April 2016 CCW meeting on killer robots as well as the report of the preparatory committee meeting on 31 August-2 September 2016. Ambassador Janjua found that international concern over lethal autonomous weapons systems continues to grow. She expressed Pakistan’s national policy strongly objecting to the development of such weapons; asserting they would be unethical and lower the threshold for going to war. She praised the “seminal” work carried out by the Campaign to Stop Killer Robots in raising awareness and commended the 2015 open letter by artificial intelligence and robotics experts. In the briefing that followed, Campaign to Stop Killer Robots coordinator Mary Wareham expressed the coalition’s view that lethal autonomous weapons systems raise many serious ethical, legal, proliferation, security, and other concerns that pose such a threat to our humanity that a preemptive ban is warranted. Retaining human control over use of force is a moral imperative and essential to promote compliance with international law, and provide for accountability. She described recent activities by campaign members, including her September 2016 visit to Moscow on behalf of the Campaign to Stop Killer Robots to address a PIR Center conference on emerging technologies. Professor Stuart Russell described an emerging consensus in the artificial intelligence and robotics community against autonomous weapons systems as “most don’t want to build systems that will kill.” He expressed concern at the potential scale of the threat, giving the example of the potential deployment of millions of tiny autonomous aerial systems containing explosives. Professor Russell provided an update steps that professional associations such as IEEE and AAAI are taking to develop formal policies opposing autonomous weapons. He said the AI community has pressed the White House for a ban as part of the high-level consultations on artificial intelligence. Steve Goose, arms division director of Human Rights Watch, said the Fifth Review Conference and CCW process on lethal autonomous weapons systems provide an opportunity for states to make a real difference to address an entire class of weapons. He said the three meetings held since 2013 on the matter have been fruitful in helping create common understandings. But if there are to be any “LAWS” it should be a preemptive ban. He calls on delegates to create an open-ended Group of Governmental Experts in December then move to negotiations in 2018 and complete them within a year. At least six participants asked questions, including Russia, which was participating for the first time in a campaign side event briefing at UNGA. Russia’s representative spoke second, reading from a written statement. He thanked the Campaign to Stop Killer Robots for holding the briefing and for mentioning the recent meeting in Moscow. According to the delegate, Russia sees no reason to move to a develop a ban protocol at the CCW, but is open to dialogue. The delegate stated that there are differences between how states and NGOs view the issue of options for future work. He expressed skepticism, but said Russia listens and the matter is discussed at inter-agency meetings. Finally, we are grateful to Handicap International, International Campaign to Abolish Nuclear Weapons, and Mines Action Canada for organizing the 2016 Humanitarian Disarmament Forum, which our campaign attended at PACE University on 15-16 October.